Fiction – paperback; Vintage; 320 pages; 2011. Review copy courtesy of the publisher. 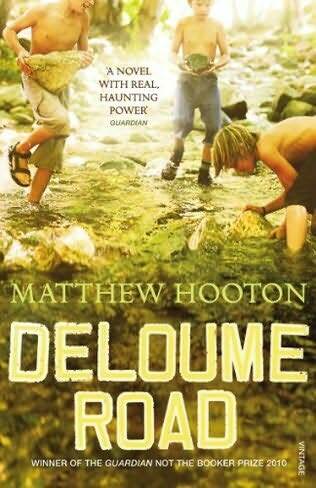 Deloume Road promptly went on my wishlist when I read KevinfromCanada’s review last year. In mid-October it was named the joint winner of the Guardian‘s Not the Booker Prize (the other winner was Lee Rourke’s wonderfully thought-provoking The Canal), but I had to wait more than six months for the paperback release. The wait was worth it. The book, which also won Bath Spa University’s inaugural Greene & Heaton Prize for the Best Novel (in draft form), is set on Vancouver Island, Canada, in a rural location somewhat reminscent of my Australian childhood. Indeed, the road of the title could almost be substituted for the dusty gravel road, lined with native bushland, farm properties and houses, where I grew up. Deloume Road is covered with loose gravel and the sunken patch at the bottom of that first steep hill is impossible to drive over without scratching a car’s exhaust pipe. The children of Deloume ride bikes down this hill, dust and gravel flying up behind. At the bottom they pull back on handlebars and jump off the divot, then hit back-pedal brakes and skid sideways. […] Blades of grass grow waist-high along both sides of Deloume and tangles of blackberry bushes and crabapple trees border the dairy farm in patches, filling in the space between the road and fence, cutting the cows off from view in places. Children stop here in August, laying their bikes in the grass on the roadside and wandering deep into the mess of thorns and branches, eating blackberries as they go, until it appears from the road that they are impossibly far in and must have sprung up from the fertile ground. Hooton structures the book in an unconventional way. The story has multiple narrative threads and these are told in short chapters, many of them only two or three pages long. One of these threads is set in the past, 1899 to be precise, and tells the story of Deloume’s founding father, Gerard Deloume. Another thread, told in the second person, is set in the present in which an unnamed narrator returns to the area and recalls, in hazy, elusive detail, a tragic incident from earlier times. But the bulk of the threads are told in the third person and are set around the time of the local tragedy I’ve just mentioned. (There’s no definite date mentioned in the book, but I suspect that it’s set in the late 1980s because one of the characters, “The Butcher”, is a Ukrainian immigrant who refers to the nuclear accident at Chernobyl.) All of them are about various residents on the road — young, old, newly arrived and everything in between. This builds a picture of a small, close-knit community, not without its tensions and rivalries, that is surprisingly multi-cultural for a place so small. There’s some terrific characters in the book, and Hooton knows how to get inside the heads of “outsiders”, those people who have moved to the community and are struggling to fit in. Two that stood out for me include the aforementioned Ukrainian immigrant, who is running a pig farm and successful butchery in order to raise the money to bring his wife and child into Canada; and Irene, a heavily pregnant widow from South Korea, who has no support network but does not want to return to her homeland despite her mother’s pleas. And then there are the children. There are four key ones and, as you might have gathered from the cover image, it is their story which comprises the dominant thread in Deloume Road. There is Matthew and his “retarded” (Hooton’s description, not mine) younger brother, Andy, and their best friend, Josh. All three come from secure homes and are loved and cared for. They go to art classes conducted by a local artist, they ride their bikes up and down the road, they swim in the local waterhole. And then there’s Miles Ford, a lonely boy who is mistreated by his farmer father and is effectively homeless — and friendless. He lurks around Deloume, keeping himself to himself, but develops a touching friendship with The Butcher, who misses his own boy back in the Ukraine. Of course, a novel of this complexity must somehow draw all these divergent storylines together, and Hooton does this superbly by having them collide in a tragedy that occurs at the very end of the novel. I won’t give anything away, but it’s a profoundly shocking conclusion, one that makes Deloume Road a truly haunting and powerful read. Thanks for reminding me about this one. I’ve wanted to read it for some time and was waiting for it to come out in the US. Now I can ask my library to add it to their shelves! I’m pretty sure it came out in paperback in the States much earlier in the year, so your library may well have a copy already. The US cover, by the way, is so much nicer (in my opinion) than the UK one. Hope you enjoy the book when you get around to reading it.
. I have been meaning to read it for ages and you convince me to shift it up the pile. This sounds absolutely brilliant Kim, its one I have been wanting to read for ages too and the paperback arrived last week so I will be devouring it in the non too distant future, all the sooner for this review in fact. Hope you enjoy it, Simon. It’s a relatively quick read because the chapters are so short, so short in fact that some of them don’t even fill up an entire page. Deloume Road could only have been written by someone who grew up on the Island; it exactly evokes the world of the West Coast forest where people are scarce and woods are ever present. But the prose poetry of Matthew Hooton’s writing does not overshadow the importance of the ‘coming of age’ novel (at every level: childhood, young adulthoodhood, maturity and old age) which it is telling. Deloume Road, a garden of Eden to Gerald Deloume, is flawed when his inability to pay the men of his work crew allows dissentionto enter the Garden, and leads to his suicide. His legacy to them is the land itself, but what each man and his family makes of their inheritance is a universal litany of the right and wrong choices which have been made since Adam and Eve were left alone to trod their solitary ways. It is a wondeful, earthy novel, bringing Vancouve Island to the world as vividly as do Jack Hodgins’ writings. May there be many more to follow.